The looming summertime has given me the perfect excuse to indulge my love of lemons. Oh! Lemons! The pungent aroma of lemon juice on my fingers from a fresh squeeze! The bright yellow, spoked discs dripping with juice! The tang! The sweetness! 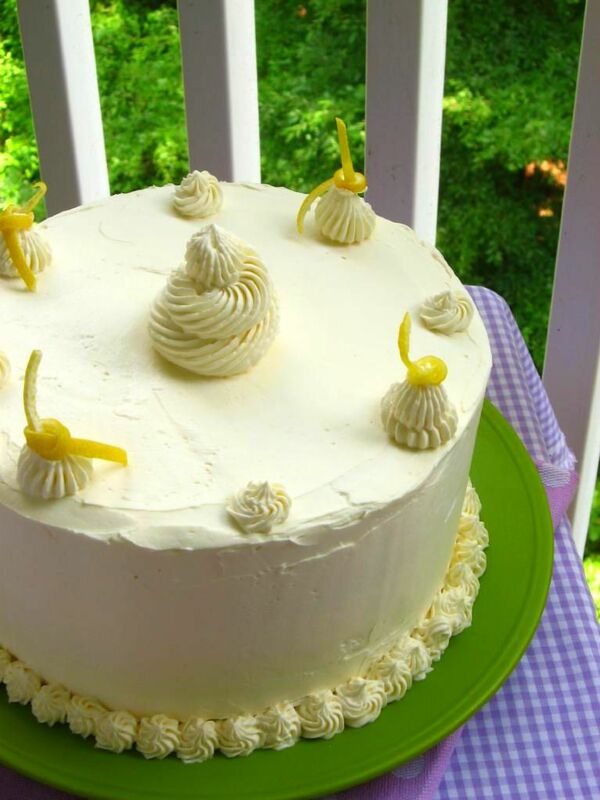 I was thrilled when my mom was pondering what sort of cake she wanted for her birthday and mentioned lemon. She made a fantastic lemon and lemon cream jellyroll cake awhile back from a cake mix and thought she might like something similar. I put on my Dr. Frankenstein hat and began piecing recipes together to oblige. My first dilemma was how to make a cake from scratch that tasted like a cake mix cake. I always get a kick out of foodies who disdain the taste of cake mix. Being an avid baker, I have news for those folks: many of us are constantly trying to attain a cake-mix-like level of moistness and buttery flavor. There are definitely downsides to cake mix (preservatives and the fact that you don’t get all the fun of baking from scratch, of course!) but in terms of taste . . . yeah, they’re pretty good at that. So how to make a delicious, preservative-free yella cake that was just as moist and scrummy as a cake mix? While considering this conundrum, I happened to see this recipe for a homemade cake mix and decided to give it a try. It smelled buttery and magnificent while mixing it up, just as it was supposed to, and baked into a lovely lemon cake with a bit of additional flavoring. Now about that lemon cream. I decided I wanted to do a lemon mousse instead, and had my heart set on a big ol’ fancy mousse layer cake. I was going to buy a cake ring and build the cake with two cake layers sandwiching a thick layer of mousse. Only problem? Well, that first part . . . the part about the cake ring. You let me know if you find one, but after visiting three stores, I’ve come to the conclusion that there aren’t any cake rings in Charlotte. Lame. Well, kind of lame, but kind of awesome, because it gave me an excuse to buy this Wilton Heart Tasty-Fill Pan I’ve had my eye on for months (Note to calm your fears: I always mention if I’ve been asked to review a product or have received something for free to review, but that’s not the case here. Wilton, y’all are welcome to send me free pans and all, but I bought this pan with my own hard-earned money and decided to share it without being asked). I am so excited about this pan! All the filling possibilities! I’m already pondering: banana cake with caramel cream filling, chocolate cake with caramel cream filling, yellow cake with chocolate mousse filling . . . but I digress! Back to the Lemon Triumph Cake at hand. I did love the Wilton pan, but I think it’ll take a bit of practice to get used to. As you can see in some of the pictures, the heart wasn’t aligned correctly on one side of the pan. This has to do with me forgetting to trim the sides of the cake so that the top and bottom were even. I feel like it might be a bit difficult to get it lined up straight, though, and it’s hard to know until you cut into it . . . at which point (after 8 hours of baking, in the case of this cake) you don’t really want to know if something’s wrong. I’ll let you know next time I use it (which will hopefully be soon!) if it’s easier to align, having had a bit of practice. Crooked heart this time around! If you don’t have the Tasty-Fill Heart Pan, don’t worry! You can make this as a regular mousse cake using a cake ring per my original plan. Just layer a 9-inch cake on the bottom and a thick layer of mousse on top of that. Chill until the mousse is firm and place another 9-inch layer of cake on top. Chill again before frosting, taking care around the mousse layer not to mix the frosting and mousse. Alternatively, if your city also has no cake rings, serve this as a regular two-layer lemon cake with the mousse on the side. Better <3 on this side of the cake. Nevertheless, crooked hearts notwithstanding, this cake was worth the effort. The yellow cake drenched in lemon syrup was moist and buttery, just like I hoped. This method of making Swiss buttercream produces hands-down the fluffiest, smoothest, silkiest, tastiest frosting I’ve ever had the pleasure of licking off my spatula. And the lemon mousse was, well, a triumph! Lemon curd folded into mousse that sets up like a bright, creamy-tangy cloud in the middle of the cake. Close your eyes and imagine a satisfying summer day — birdsong, sprinklers, green grass, sunshine, lemonade, lounge chair, long naps and good books — with a little sophistication mixed in. That’s what this cake tastes like. If that doesn’t make you want a slice, I don’t know what will! Note on scheduling: I might schedule this cake baking in the following way. Make lemon curd and refrigerate two days in advance. Bake cake and coat with lemon syrup one day in advance, wrapping carefully and freezing. On day of serving, make mousse, trim and fill cake (much easier with frozen layers! ), make frosting, and assemble. To make lemon curd: In a large bowl, beat the butter and sugar with an electric mixer, about 2 min. Slowly add the eggs and yolks. Beat for 1 min. Mix in the lemon juice. The mixture will look curdled, but it will smooth out as it cooks. In a medium, heavy-based saucepan, cook the mixture over low heat until it looks smooth. (The curdled appearance disappears as the butter in the mixture melts.) Increase the heat to medium and cook, stirring constantly, until the mixture thickens, about 15 min. It should leave a path on the back of a spoon and will read 170°F on a thermometer. Don’t let the mixture boil. To make cake: Process sugar, flours, milk powder, baking powder, and salt in a food processor for 15 seconds to combine. Add butter and vanilla and pulse until the mixture resembles coarse meal (you want this much finer than, say, a pie crust). Freeze the dry mixture in a zipper-lock bag for up to 2 months or use immediately. To make the cake, adjust an oven rack to the middle position and preheat the oven to 350 degrees. Grease and flour two 9-inch cake pans (the Tasty-Fill pans, if you’re using those). With an electric mixer, beat the prepared cake mix, 1 1/4 cups warm water and 2 large room-temperature eggs until the mixture is smooth, about 2 minutes. Scrape the batter into the prepared cake pans and bake until a toothpick inserted in the center comes out clean, about 25-27 minutes for two 9-inch layer cakes. Cool the cakes in pans for 10 minutes, then turn them out onto a wire rack. Poke holes in them and spoon lemon syrup over generously. Cool for about 30 more minutes before placing cake layers in freezer for at least 30 minutes. This helps a ton with trimming, filling, and decorating! To make lemon syrup: In a small saucepan, combine the sugar, water, and lemon juice over medium heat. Bring to a boil, reduce the heat, and simmer until the sugar has dissolved, about 5 minutes, stirring occasionally, Remove the pan from the heat and allow the syrup to cool, about 20 minutes. To make the mousse: Pour 2.5 tablespoons water into small saucepan. Sprinkle gelatin evenly over. Let stand until gelatin softens, about 15 minutes. Meanwhile, place 7/8 cups lemon curd in large bowl. Stir 3/8 cup curd in another small saucepan over medium-low heat until very warm. Stir gelatin mixture over medium-low heat until dissolved and liquid is clear (do not boil). Whisk warm gelatin mixture into 3/8 cup warm curd. Gradually whisk gelatin-curd mixture into curd in large bowl. Using electric mixer, beat egg whites in medium bowl until soft peaks form. Gradually add sugar, beating until whites are thick and glossy. Fold whites into curd mixture in 3 additions. Using same beaters, beat cream in another medium bowl until peaks form. Fold into egg white-curd mixture in 3 additions. 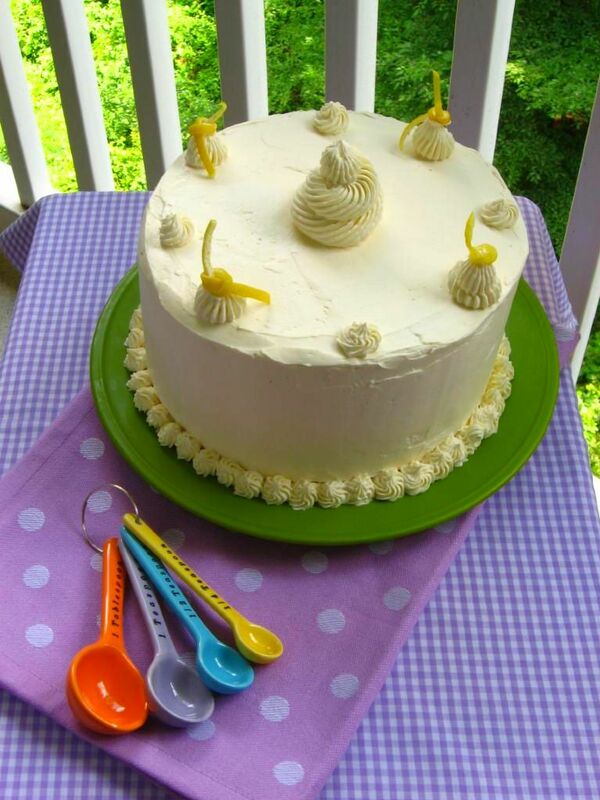 To make lemon Swiss buttercream icing: Combine sugar and 1/2 cup water in a small saucepan and bring to a boil over medium-high heat, stirring to dissolve sugar. Boil without stirring until syrup reaches 240° on a digital thermometer, about 5 minutes. Meanwhile, in a stand mixer with whisk attachment, beat egg whites on medium-high speed until soft peaks form. With mixer on medium speed, gradually pour in hot syrup in a thin stream; avoid pouring syrup on whisk. Increase speed to medium-high and beat until stiff peaks form and mixture is cool, about 8 minutes. Reduce speed to medium and add butter 1 tablespoon at a time, beating after each addition. (If at any time buttercream appears curdled, beat on high until smooth, then reduce speed to medium and continue beating in butter.) Once all butter is added, beat on high speed until buttercream is smooth and fluffy, about 1 minute. Beat in vanilla and lemon extract. To assemble the cake: Level the layers using a long serrated knife. 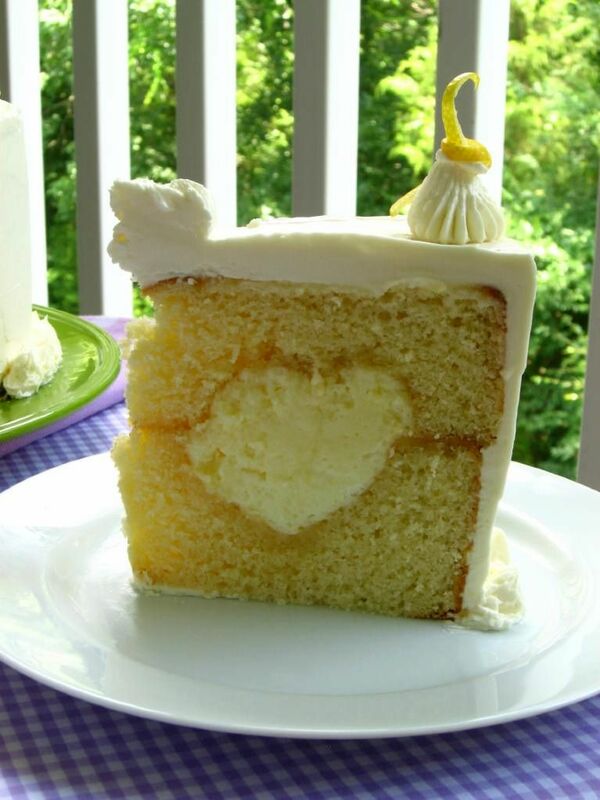 If using a Tasty-Fill Heart Pan, align heart and then trim sides of cake to make them even. Fill both sides of the heart with mousse, leveling it off using a spatula (see instructions in the note below for making this a regular mousse cake). * Place the top layer on the bottom layer, aligning the heart. Cover cake with a thin coat of icing as a crumb coat and chill until the icing is set, 20 minutes or so. 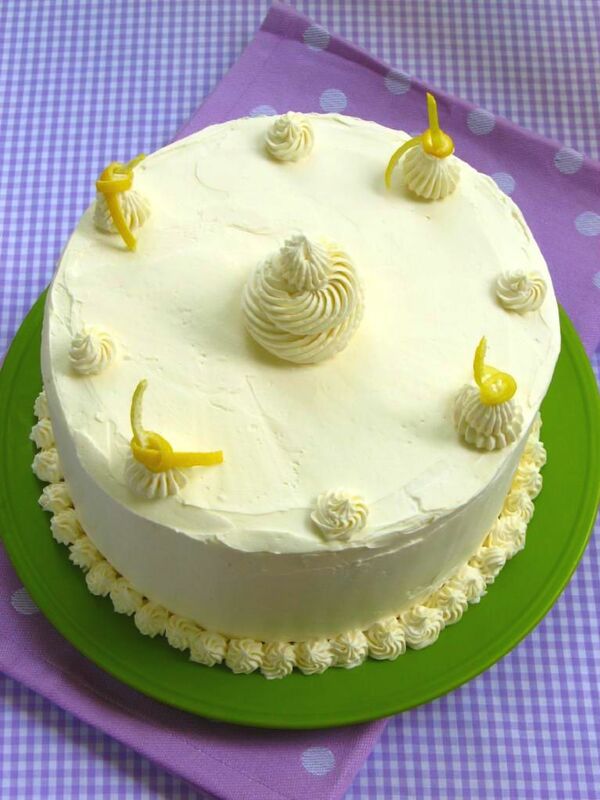 Frost cake and decorate with slices of lemon peel. Store, covered, in refrigerator. Set out about 10 minutes before serving to soften the icing. *NOTE: Make this as a regular mousse cake by using a cake ring. Layer a 9-inch cake on the bottom and a thick layer of mousse on top of that. Chill until the mousse is firm and place another 9-inch layer of cake on top. Chill again before frosting, taking care around the mousse layer not to mix the frosting and mousse. 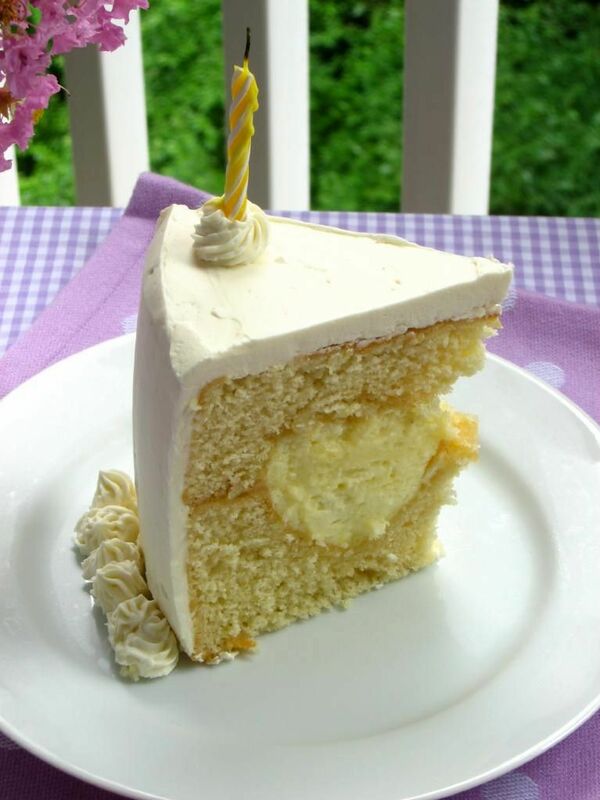 Alternatively, serve this as a regular two-layer lemon cake with the mousse on the side. Oh I didn’t have to close my eyes and imagine anything to want a piece of this cake. The picture took care of that (crooked heart and all)! This looks delicious and oh so cute! I must get me one of those pans too! Haha! Thanks for sharing! Beautiful Cake. Vivian is lucky to have such a good cook making her cakes. It not only looks great, the recipe sounds wonderful too. You should be on the food network. I love your blog. It was every bit as good as it looked! 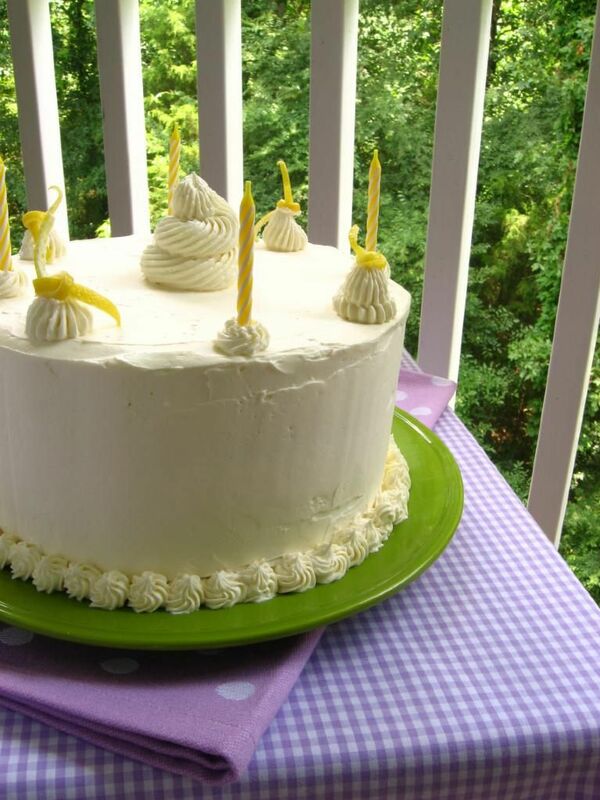 Light, buttery, lemony and the icing was well, just the ICING on the cake (pun intended!) 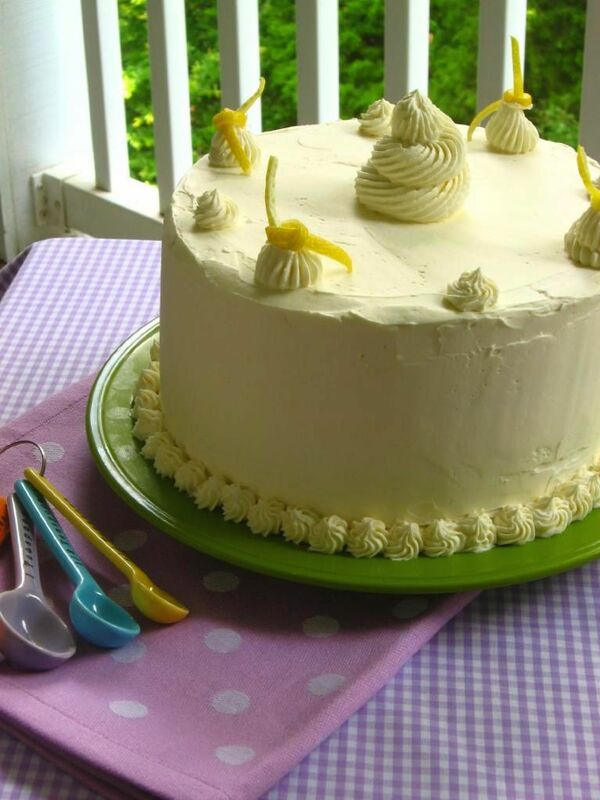 Smooth, light Swiss Lemon Buttercream…. perfect! I ate WAY too much! The heart on the side Julie did trim was perfectly aligned so I think it is just a practice-makes-perfect thing with the hearts. It was a nice surprise when I cut into it and said, “oh, a heart”! Very special, indeed! Thanks, Julie. The only thing I dislike about cake mix is using it. 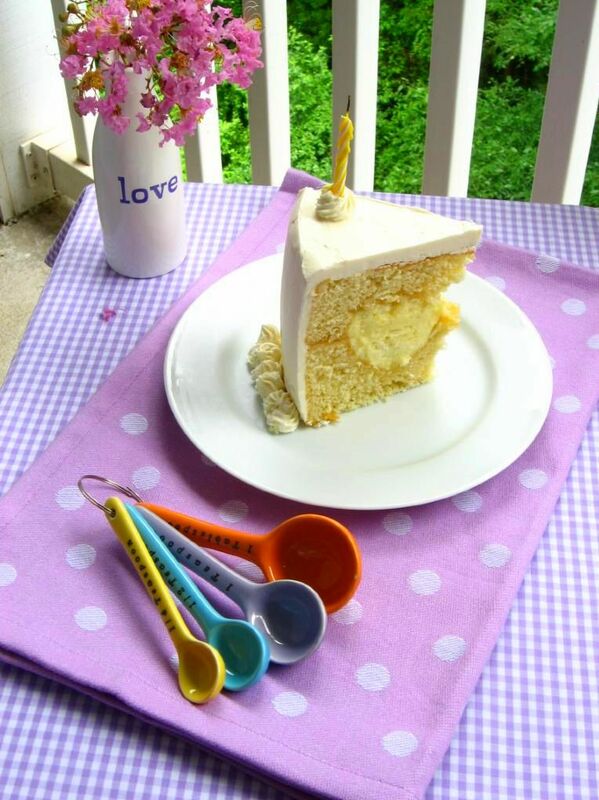 The taste is undeniably amazing…I just like the satisfaction of knowing that i made a cake from scratch! This looks amazing. I love that heart and all of the lemony tartness! 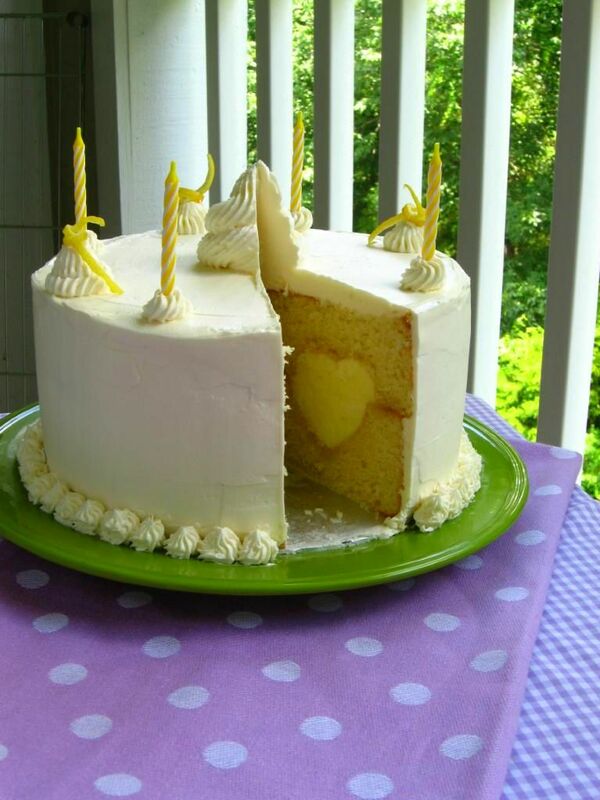 What a cute cake from the lemon rind knots to the heart on the inside. I’ve only seen this cake pan in advertisements but not as someone who has made a cake with it. It’s great! I just found that recipe for the homemade cake mix a couple weeks agao and I’ve been wanting to make it. It might end up being my birthday cake, who knows?! This looks amazing! I am a lemon lover myself so I will be trying this soon! Ohhh! YUM! The lemony goodness is calling me. Your mom is a very lucky lady! I love the heart inside the cake. What a wonderful surprise! First, where did you get your measuring spoons? I love them! My boyfriend loves box mix cakes, but I never really like the texture of them. I wonder if a homemade box-mix-like cake solves that problem. 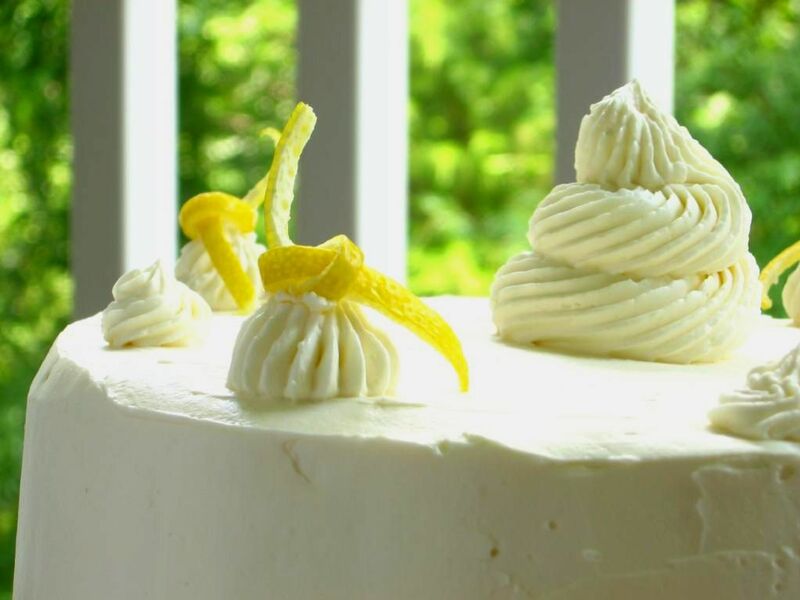 I am all about that lemon mousse… as soon as I have an excuse to make it, I shall! Again, your cake looks absolutely beautiful. You can’t even tell the heart is crooked besides in that one closeup picture. I’m sure your mom loved it. Thanks so much Megan! My mom bought me the measuring spoons and she actually posted (below) about them! Apparently they’re from World Market. I love them too!! I love the heart on the inside of the cake! What a cool idea! I just HEART the WHOLE cake! <3 Too bad it is gone! Not sure if Julie replied where the measuring spoons came from, (or if she knows). Since I gave them to her, I thought I would let you know I bought them at World Market for a mere 2.99. I also bought myself a solid white set, since I am a “white” freak… I have white things all over the my kitchen. These spoons sure photographed well! They have the measuring cups to match, also. Your photography and eye for design is just beautiful!! And those cake pans. TOO TOO adorable. But not TOO adorable…you know? I know you posted this a while back but ever since I have been wanting to make this cake. Well finished making it today and it was so incredible! I was so proud of myself for making this. I know you had some problems lining up the layers to make the heart perfect. I found that if you line up the “cores” of both layers and then trim the sides it comes out perfectly. Can’t wait to make more delicious combos with this pan but this lemon cake is definitely going into my “hall of fame”. Thanks for sharing such a great recipe! YAYYYY Robin, that is SO wonderful to hear!! Did you happen to snap pictures, because I’d LOVE to post them on the “About Willow Bird Baking” page in the reader photo section. I’m so, so glad you tackled it and loved it, and even more glad that you’re proud of yourself for the achievement! I felt the same way (and my heart was crooked — ha!) Way to go, girl!! I want to bake this magnificent cake for my little brother’s birthday and I have a have a question about the construction : is it possible to cut the cakes in half (or maybe bake 4 cakes instead of 2) to double up the number of layers ? I am afraid it will be less moist but I don’t have your experience as cake builder so I would like your opinion :-). Anyway, I love your blog (next challenge german cheesecake). Hi Beth! You can use a store-bought curd for the mousse, for sure! The mousse ends up quite sturdy because of the gelatin, so the heart comes out really cute 🙂 Enjoy! I am in the middle of assembly this cake for our thanksgiving get together tomorrow and I noticed that The cake instructions don’t indicate when to add the 1 Tablespoon Lemon Zest or the 1-2 Teaspoon Lemon Extract. I threw it in at the end and the cake is now in the oven. I hope this doesn’t ruin the outcome. Also can you tell me if you have ever used Limoncello (Alcohol) in the lemon syrup? If not would you suggest it a good idea? Thanks for any and all input on my questions. Oh my gosh! I can’t believe I left that out! You did just fine by adding it in at the end, though. I can’t wait to hear if you love it! I’ve never used limoncello in my lemon syrup, but it sounds yummy. I’d say give it a shot! Happy Thanksgiving!